This is just going to be a quick little post. No I haven't disappeared and I haven't forgotten about all of you it's just been kind of a rough week. Not wanting to bore you with TMI but I have a form of chronic arthritis and recently had to have some medications changed and lets just say they are really throwing me for a loop! I am hopeful that once I get used to the new meds and that they will work for me I will be able to get back into a more regular routine with blogging. Here are a few recent cards. All of the techniques for these cards are from Technique Junkies. 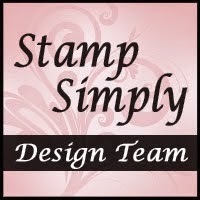 If you love trying new techniques you should check out Pat's Stamping Place, by Pat Huntoon. She puts out a wonderful full color newsletter that is filled with great techniques! All of the information can be found ---HERE. Also Don't forget to check out her blog The Technique Trail. To all of my SB3 Sisters, I know there have been some recent changes in our group & I just wanted to say Thank You to Katie!!! Thank you so much for everything you did for our group!!! 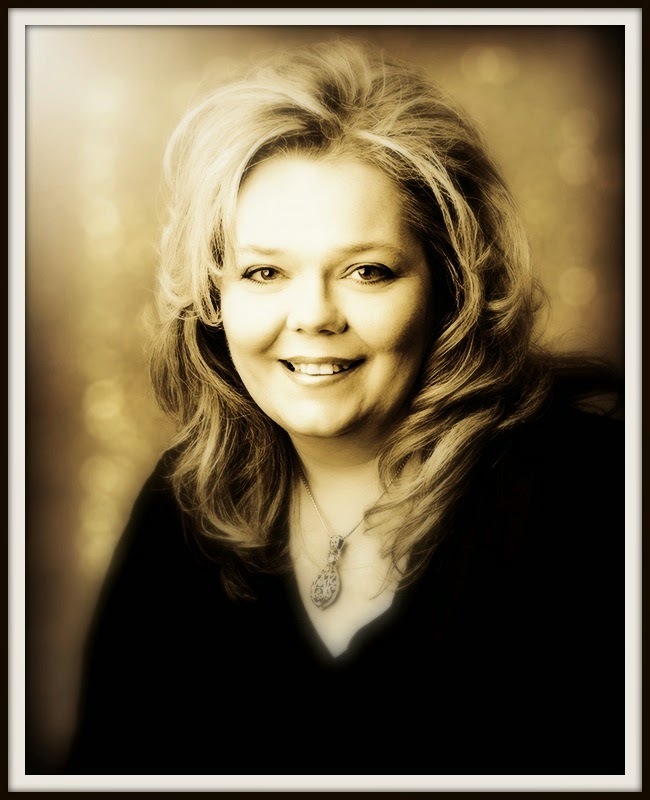 Also a warm welcome to Denise!!! Thank you Denise!!! A HUGE thanks to all of the Sisters, thank you so much for your continued friendship, support and wonderful comments!! Thank you for stopping by and I hope you have a wonderful weekend!! Corie-Creations by Corie-nominated me for the Excellent Blogger Award -- a HUGE THANKS to you Corie!! I hope you are having a terrific day and can take a little time to create. Thanks for stopping by!! 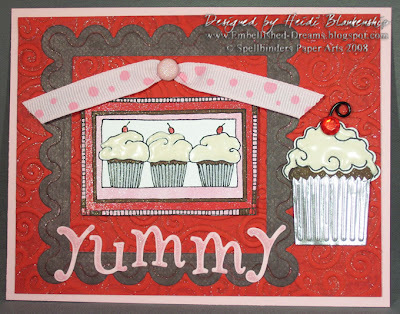 New Spellbinders Dies!! I know so many of you absolutely love Spellbinders Nestabilites and now there is even more to love with the NEW Megabilities Nestabilities!! These dies are huge and they will give your creativity endless possibilities! You can make larger cards, tiny cards, books, labels, cards with fun folds and the list can go on and on. The dies come in two sets, one with a straight edge and the other has a scallop edge. I used the new Megabilities Nestabilities dies for one of my designs for CHA. I made a small wall hanging using the largest straight edge die. Here is a close-up of the flower and you can also click on the image to enlarge~The size of the wall hanging without the beaded fringe (just the metal piece) is about 6 1/4 inches long. All of the coloring was done using Copic markers. A little technique that I love to do with the Copic markers is once you are done coloring lightly spritz with rubbing alcohol. 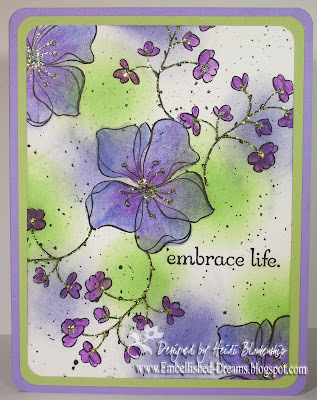 The inks will dance around blending together and leave you with a beautiful background. 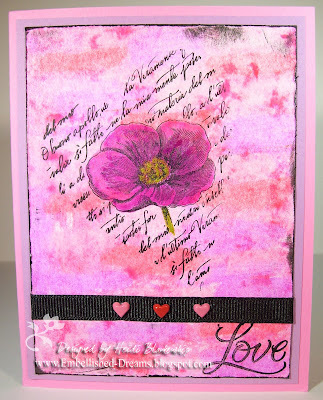 Here is another card that I designed for CHA. We (Spellbinders DT) were given a challenge to design a card using the Nestabilities in a different way. I used two square Nestabilites to create a scallop frame and I also used a small scallop oval to create the frosting for the cupcake. The little foil cup was also made using a die. I used part of the Architecture Columns die to make the foil cup. 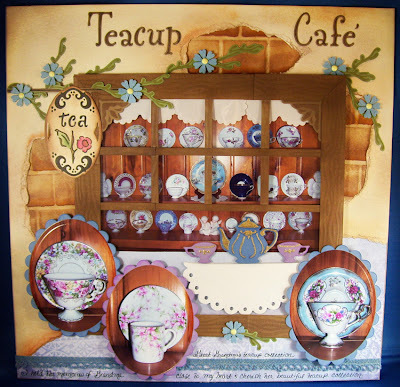 I wanted to say Thank You so much for all of the great emails and wonderful comments about my Teacup Cafe' LO!! I really appreciate all your kind words!! Thank you so much for stopping by and I hope you have a Fantastic week!! I am back home from CHA in Anaheim, CA and I can say it was truly an amazing experience!! This was my first CHA so I didn't really have any idea how HUGE it was and what to expect. I went with Spellbinders and several of the ladies from the DT. It was a lot of work, setting up & taking down the booth, helping in a class, doing demos and make-n-takes but it was worth every second!! I met soooo many wonderful, amazing and talented people!! I met some of the "Dirty Dozen" girls from SCS, Ellen Hutson, Tim Holtz and Suze Weinberg just to name a few. I seen tons and tons of beautiful design work, the booths were just unbelievable. But I have to say Spellbinders booth was so Beautiful, Elegant and Magical all wrapped up into one stunning display!! 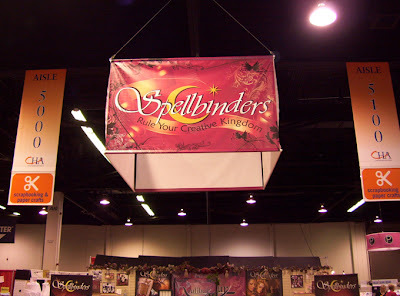 Spellbinders Booth~ It's so beautiful & elegant!! Click picture to enlarge~ Just a Note~This is the prototype for the Xcalibur, a motorized (electric) die cutting & embossing machine. It cuts and embosses beautifully with the touch of one button (Yes-Just ONE button!) and it is soooo quiet you can be using it and talking on the phone at the same time! No more ratcheting! 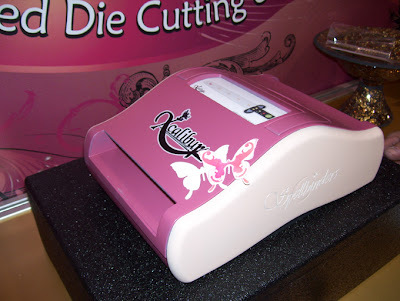 The Xcalibur will be great for anyone who may have issues with strength due to carpel tunnel or arthritis or if you are a late night crafter (like myself) & just want a very quiet machine that will do all the work with the touch of a button and not wake up the whole house! While at CHA people had a chance to see demos with the Xcalibur and then Spellbinders asked for their opinion by filling out a survey and in return they were given a Spellbinders T-Shirt. How great is that-a company that cares and wants to make the best machine possible for their customers!! So like I said this is just the prototype and there will be a few changes-the color is going to be a little brighter (wine and black) and it will have black flourishes and swirls. Doesn't that sound pretty? The target price point is around $129.99 -could be a little more or less and it will be available for ordering at the summer CHA. I also wanted to mention because several people have asked, the Xcalibur will not replace the Wizard. I believe that the Wizard will be my go to machine for all of the tougher jobs-smashing bottle caps, charms and setting eyelets. The Wizard is that machine that you can run the kitchen sink through (j/k), it's the machine that will push the limits!! How about some art? Would you like to see a couple designs that I made for CHA? This is a teacup collection that was my Great Grandma's and now I have it displayed in my home. I will be honest it took awhile to do this LO but it was so much fun and I love the outcome! I wanted the LO to look as if you were outside of the cafe` looking in the window. Glue Dots-Glue Dots 1/2", 3/16"
Click the picture to enlarge~ I used Copic markers for coloring in the stamped images. I love being able to blend the colors!! I wish you could see this card IRL, I used the Spica glitter pens and it sparkles!! A couple of my favorite photos~ While at CHA I had the pleasure of meeting Ellen Hutson, she is so wonderful, the sweetest lady and very talented!! (L-->R) Donya, Ellen, Me & Wendy It was so mush fun talking with Ellen, be sure to check out her blog. Pinch me!! I still can't believe this next picture!! Woo-Hoo-the one and only Tim Holtz!! 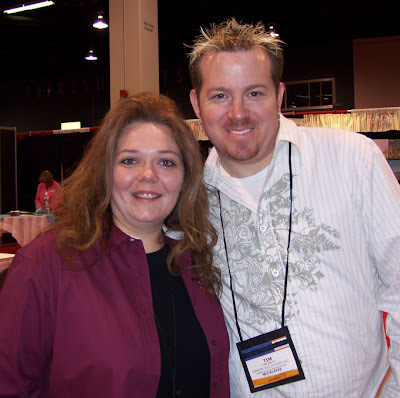 Stacey Caron (owner of Spellbinders) knew that I really wanted to meet Tim, so she introduced us and then my sweet friend Holly (from the DT) took the picture of us. How sweeeeet is that!!!! Thanks so much for stopping by today and be sure to check back soon, I will be posting more pictures and art from CHA. I hope you are having a wonderful weekend!! Hello! I know it has been awhile since I have been able to post some new art. I'm sorry, it's just been a little crazy lately trying to get projects done for CHA. 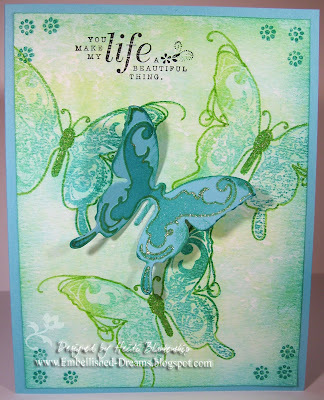 I am having so much fun designing with Spellbinders!! 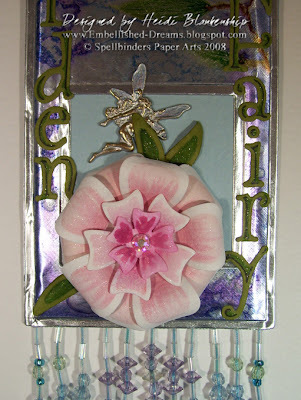 I will be leaving this Friday for Anaheim, California to meet up with several of the ladies from the Spellbinders DT for CHA. I have never been to CHA-I'm so excited I can hardly stand it!! For more info on CHA click --->HERE. 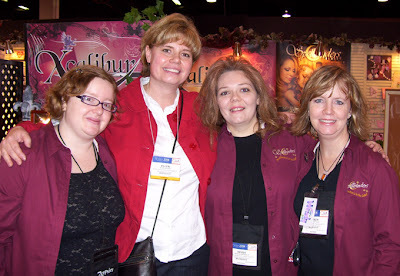 If you are going to be at CHA please stop by Spellbinders booth (#5071) and say Hello!! 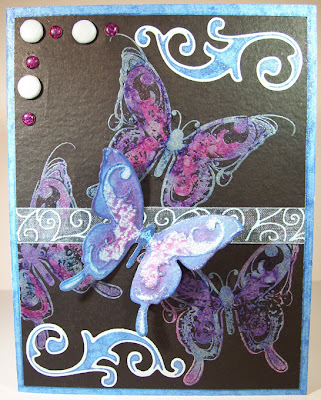 Here is a card that I designed a few days ago using the Spellbinders Doodle dies and Butterflies 2 die and matching stamps along with the Copic markers. 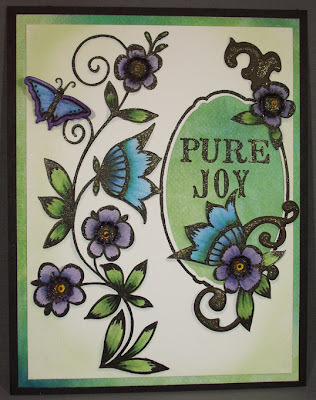 On the background piece I stamped & embossed the butterfly images and then colored over them with the Copic markers and then spritzed with rubbing alcohol. The best thing about doing this is you doing have to be great at coloring! I just filled in the space with the colors of choice and then let the rubbing alcohol do all the magic! Spritzing with the rubbing alcohol activates and moves around the inks. It's a little hard to see in the picture but I added touches of glitter on the card using the Spica glitter pens by Copic. I also colored the darker (plum) brads to match the butterflies using the Copic markers. I will be back later tonight with the supply list! Thanks so much for stopping by!! I hope you are having a wonderful week! !